3-Ingredient Cream Cheese Sausage Dip - SOOOO good! Sausage, cream cheese, and Rotel. Ready in under 10 minutes. Great for parties! There is never any left!! I must confess. I had my doubts about this recipe. With only 3 ingredients I wasn't sure this was going to have much flavor. Well, I was completely wrong! This stuff is awesome!!! I am not a big fan of plain cream cheese. I love it in dips, casseroles, etc. But just cream cheese on a bagel - nope. I was worried that this dip would have too much of a cream cheese flavor, but it didn't. 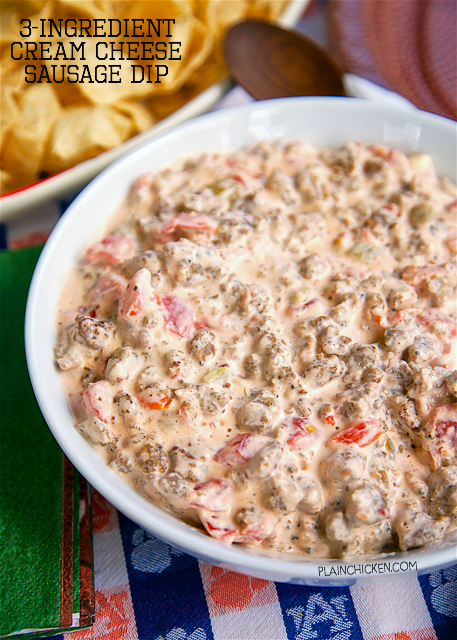 The sausage and tomatoes really shine in this dip. We served this with some scoops tortilla chips and it was perfect! 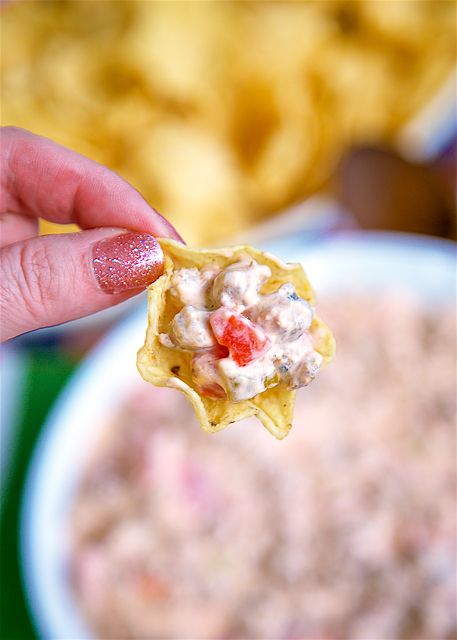 This is a great dip for when you need something quick and easy for a party. It is always a hit! In a large skillet over medium-high heat, cook sausage until crumbled and no longer pink. Drain. Add Rotel and cream cheese to skillet. Stir until cheese melts. I have been making this for years. My family loves it and no college football Saturday or holiday would be complete without it! I keep it warm in a small crock pot on the counter. It is super easy and so good!! This is one of my all time favorite dips....easy and delicious! This delicious dip is always a hit and there are never any leftovers! Can you use low-fat cream cheese? I think that would be fine. I would stay away from fat-free cream cheese - it doesn't usually melt good. Enjoy! Not sure - I've never served this cold. This is soooo good if you make it within Jimmy Dean’s Hot Sausage! Just a bit of spice to kick it up a notch. I have been making this dip for about 16 yrs now. When I got it from a coworker, she made it with italian sausage. I then started making it with Tennessee Pride sausage. I make it with with ground beef mostly now. It is good all 3 ways. And I NEVER have leftovers. I’ve been making this for years but I use two rotel, two cream cheese, and one sausage. I call it pink dip. It’s hard to stop eating. We love it! I made this today, but I used a little extra cream cheese and Rotel. It was a hit with my family! I make this all the time. We call it garbage dip! Not sure where the name came from. Hi, is Velveeta cheese better to use than cream cheese or is it preference of taste??? I've seen other recipes that have velveeta but cream cheese is best. One if you are me.